These are sweet, practical ideas to reinforce the concept of loving others! The tea party for widows would be a wonderful way to teach our children about serving. Thanks, Tracey! Growing we did a tea for widows with a group of homeschoolers and it was a wonderful experience. I thought you had some really good ideas in this post! I’ll have to remember them for the future! Thanks, Katy! I’m excited to do some of them with my daughter this year and to hopefully keep adding on every year! What an awesome idea to really teach about Valentine’s and love others well, together! Pinned it and thanks for sharing at Walking Redeemed! Thanks for you kind words and for pinning! I appreciate it. Deanna, I really like how you broke each of these ideas up into hand, voice, and deed. I love the service aspect because too often Valentine’s Day is about me, what I get, and I really want my kids to learn that it’s about loving others and how we can do that. So many great ideas here but I love the widows’ tea idea the best. That’s something I can see us doing at our church as we have a lot of widows. Thanks for sharing your heart and ideas. Thanks, Keri! You are right, it’s a great way to practice loving others. We did a widow’s tea with a group of homeschoolers when I was younger and it was a blast. We all invited a widow as our date and sat with them and served them. I can’t wait to do it with Kenna! What lovely ways for kids to express how much they care! We made valentine inkblots this year! Thanks for commenting! Oh, I love your inkblots. They turned out really cute! Deanna I love this! My 10-month isn’t old enough for all of these things yet but we can definitely celebrate three days with your different themes, love it! Thanks for sharing on the weekend re-Treat link party! So glad you like it! You are right, it’s so easy to adapt the idea to work we different ages. I’m looking forward to celebrating with my daughter this year. Thanks for hosting, love your party. Just got done linking back to you guys. Thank you for sharing great ideas that teach kids the real meaning of Valentine’s Day. Thanks for stopping by and commenting! I’m looking forward to celebrating with my daughter this year. These are some wonderful Valentine’s Day ideas that can become annual family traditions. Thanks! I agree. Our oldest just turned 3 last week and is at the perfect age for starting traditions. It will be fun. 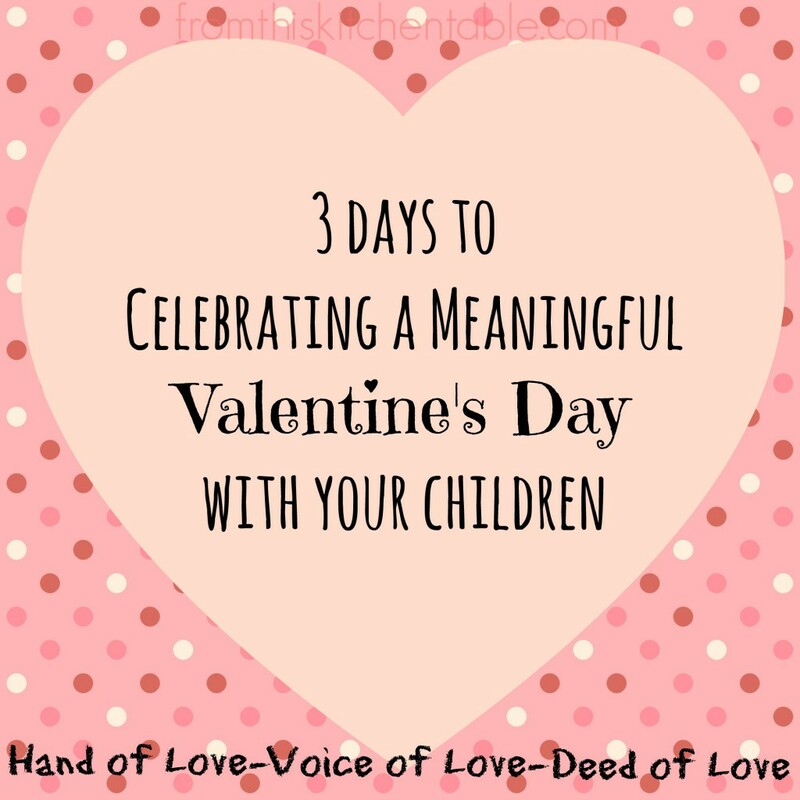 These are such simple and sweet ways to celebrate love with your children. Thanks for all the great ideas! Thanks for stopping by and commenting! I’m really looking forward to celebrating with our daughter this year. You are a good woman and that is priceless. 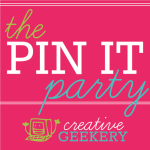 Stopping by as co-host of Homemade link Party. Aww, thanks Carrie! I do my best and sometimes it works and other times not. 🙂 This year is a fun one for holidays with our daughter. I don’t thing we remembers anything from previous ones so everything is a first again. Wonderful ideas and suggestions and I think it is great that you are teaching children the real meaning of a holiday instead of keeping all the focus on candy and cards! Thanks so much for your comment and stopping by! I need to get with it and get stuff planned out! Running out of time. These are some really fun ideas! Love the thought that it isn’t just the words that matter. We need to “do the deed” of loving too! So true! The actions/doing beyond the words are so important too. Thanks for stopping by!